Rats save lives. When I first heard this unusual phrase, as an intern at Ashoka, I was perplexed and curious. How? My mind lingered on this question for a while. The answer amazed me and learning about the process has led me to pen this blog so that more people can familiarize themselves with one of the most innovative social enterprises in the world. APOPO is a non-profit organization that trains giant pouched rats to detect landmines and tuberculosis. Rats, due to their ability to smell explosives like TNT as well as the distinct smell of TB, are able to swiftly sniff out explosives and samples containing TB. APOPO Founder and Ashoka Fellow Bart Weetjens described this approach as “seeing rats not as vermin but as a natural resource.” Having had hamsters and other rodent pets when he was young, Weetjens developed an affinity for these creatures and recognized their sociability and ability to be trained. He began exploring this idea at his university in Belgium and later moved research and development to Tanzania to put it into application. Each HeroRAT – as they are referred – is trained for a period of nine months and receives accreditation from local agencies in countries where APOPO operates. Because of their local availability, ease of transportation, and transferability between different trainers, rats have proven to be sustainable as well as cost-efficient agents for this process. Partly due to APOPO’s effort, Mozambique has been declared landmine free since 2015. Enabling communities to become landmine free promotes economic as well as social growth in vulnerable areas which are normally subjected to the gravest impact of undetected landmines. Weetjens’ vision when starting APOPO was to empower vulnerable communities, and his approach has seen a high success rate. His venture into using rats for TB detection also began after assessing the needs of the community where he was working. Many of his staff members at APOPO were HIV positive and got infected by TB. So, he researched and expanded the role of the HeroRATs from open fields into medical labs where they test sputum samples to identify those with TB. In 2017 alone, 2,380 landmines and explosives were destroyed, and 61,928 suspected TB samples were screened by APOPO. The organization’s largest programs right now are in Cambodia and Angola. They are looking to potentially expand into Colombia and Zimbabwe in the coming years. 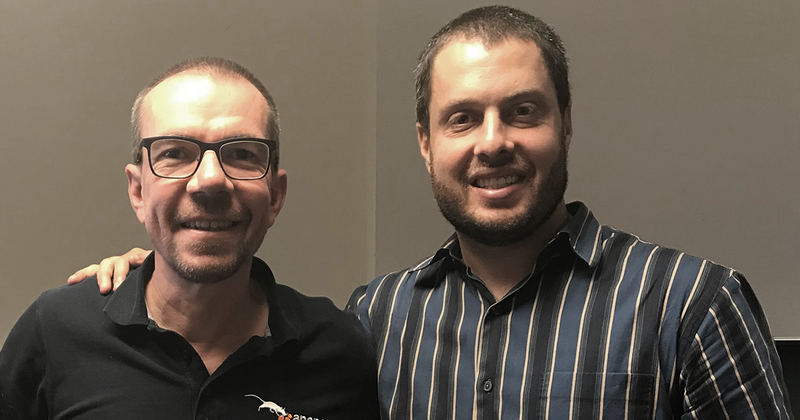 Photo caption: Bart Weetjens (left) and Charlie Richter of APOPO at a meet and greet event organized at the Ashoka Global Office in Arlington, VA this past July.